Whew! Halloween was a ton of fun but I'm glad it's over. I'll admit I'm slightly scared by the overly frightening yard decorations and the pounds of candy all the children around me are ingesting, although I love seeing all the kids in their costumes. My son had a ton of fun trick or treating and even though we only did a little bit, we have a scary amount of candy, especially considering my sleep deprived and slightly hormonal postpartum state! Like a good parent I promptly picked through his bucket after he went to bed Saturday and removed the snickers/musketeers/milky ways (for baking) and the tootsie rolls (for me, ahem). He's only two, he didn't even notice. 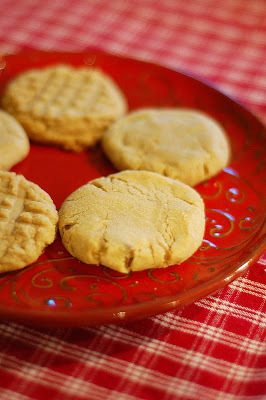 I'm sure you have a lot of candy lying around, too, which is why I think you should try these sneaky little peanut butter cookies. I use my favorite dough recipe (from my mom's aunt, it's a good one, too) and after I scoop the dough, I flatten it out and put in a 1 inch piece of candy bar, happily pilfered from my son. Then I wrap the dough back up around it, squish it a little, and bake as usual. The end result is WAY better than a regular peanut butter cookie, which I still make for my non chocolate eating tall man. Note- I like my cookies a little bit flatter, so I squished these before and after baking. If you like them a little puffier, look at this post and all the goo-iness. Yum. Your cookies look so appetizing! Love the red accents! Ohhh I HAVE to try these! I love a good peanut butter cookie. I like my cookies flatter too. My PB cookies never spread and I always squish them halfway into baking becase I forget to flatten them. 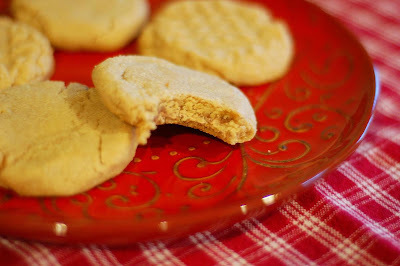 I often make peanut butter cookies that include Butterfingers. Yours look great.